Library Purchases New Rug For Storytime! The Library has a new addition in the form a colorful rug for kids to use during Storytime. The rug features different Dewey decimal numbers with the picture of what can be found at that number. 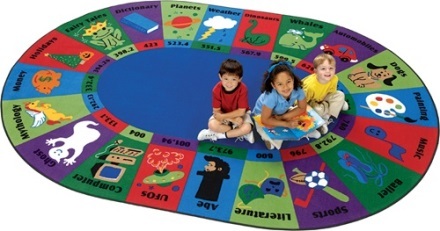 The Library would like to THANK the Lakota Foundation for the grant they awarded us for increased children programing that made purchasing the rug possible. The rug will remain in place year around so be sure to stop by to see it! !